I know, I'm obsessed. Another Neil Gaiman book? Yes, don't judge, the man is brilliant. 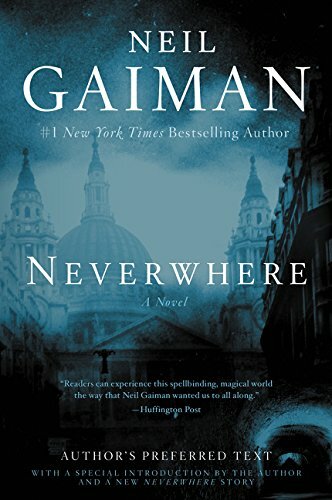 And Neverwhere is my new all time favorite of Gaimans masterpieces. Richard Mayhew lives an ordinary life in London. He works a normal job, has a normal (if overbearing and condescending) fiance, pays his bills on time; just a pretty generally sensible person. All of this changes when he quite literally stumbles upon a bleeding, semi conscious girl (Door) on the way to an important dinner function one Friday evening. Against the protestations of his fiance Jessica, Richard comes to the young woman's aid. She insists on no hospital, so he helps her back to his apartment to get cleaned up and rested. Little does Richard know, doing so entangles himself in the peculiar world of London Below and Doors quest to find her family's killer, while avoiding being killed themselves. As I said before, this book was most definitely my favorite Gaiman read by far. For me, discovering London Below along with Richard was something akin to a dream come true. Being a lover of fantasy and magic myself, seeing that come alive for a character like Richard, who's life is so relatable in its mundaneness, was thrilling (and gave me a little hope that maybe there is some magic within our ordinary lives). The whole quest to find the killer was very "Labyrinth-esque" to me and the entire world of London Below was utterly fascinating. It was dark and ethereal but magical and enticing all the same. The ending of the book was PERFECT, even better than what I had been expecting (don't worry no spoilers here!). The various trials and tribulations Door and Richard encounter run the gambit of tense and frightening to comical and clever. I cannot recommend this one enough! Who else is a huge Gaiman fan? Which one is your fav? I'm back with another Gaiman masterpiece! I have gone so off course with my reading challenge the past few reads, this one didn't fit into any of the categories, but it's Neil Gaiman! I couldn't help myself. Nobody Owens, or Bod as he is known around the graveyard, is an usual boy. Granted the Freedom of the Graveyard as a toddler when his family was brutally murdered and he toddled into the graveyard, he lives in a world of shadows. Living in the graveyard, his playmates are ghosts, his lessons consist of learning how to "fade" and why not to trust a ghoul. Silas, his undead guardian, has assumed responsibility for Bod, ensuring he is fed and clothed, procuring things from the outside world that a growing child might need. Bod is never to leave the graveyard as the man, Jack, who murdered his family still hunts for him to finish the job he was tasked with completing, killing him. As Bod grows up into a young teen, he eventually must face the man Jack, but will he come away unscathed? This book was quirky and dark, full of rich and vibrant characters, which is kind of odd considering mostly all the characters are dead, or undead, or somewhere in between. (Also why does auto correct keep trying to change "undead" to "unread"? Apparently auto correct hasn't read much fantasy/fiction *sigh*) Bods adventures growing up in the graveyard were magical and fun to read, and his strength and fortitude were something I admired in a character. My personal favorite was his foray into ghoul world. (Note to self, never foray into ghoul world!) This is a book you could read solo as an adult, or read with your kids (though it's never childish) and enjoy it just the same. As an added bonus, the reading was punctuated by some pretty stellar illustrations by Dave McKean that really brought the book even more to life. Any other Gaiman fans out there? What else should I read of his?